Spinning a new take on World War 2, Soldiers: Heroes of World War II pulls you out of the field and into the commander's head. Your group isn't as large as an army in Age of Empires, but the inclusion of vehicles pushes it out of the realm of squad warfare. 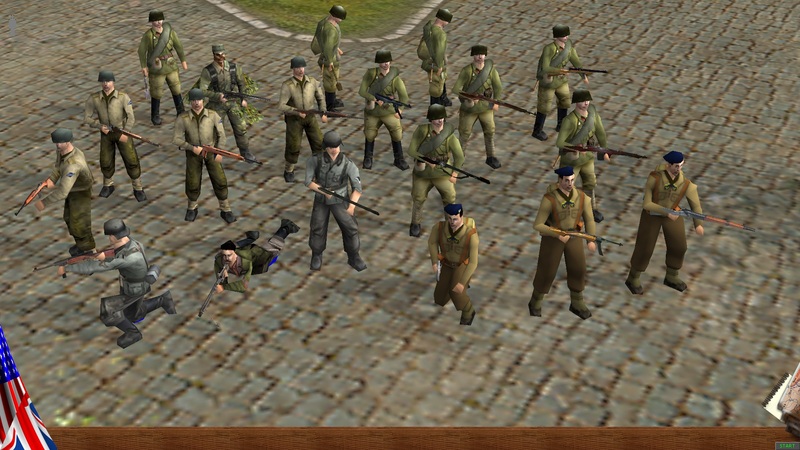 Some squad based elements remain however, as you can take direct control of an individual soldier or vehicle and aim and move him directly with your keyboard and mouse. This can be used to great effect in raising the efficency on the front line. The game's dozens of soldier and vehicle meshes are all well modeled, textured and animated. 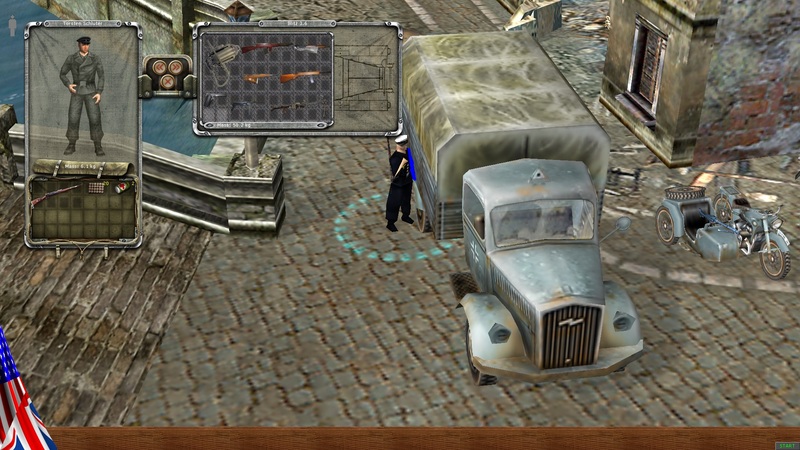 The game's locales are very well done too, taking you to war torn Europe. A new member have joined Tacos Mod: dgn! He have already contributed with a lot of knowledge of WW2, as well as added new content to the mod directly & helped with technical things. Many of the coming changes & additions in Alpha-8 will be from him. Alpha-8 is well in progress, with a 2-part mini-campaign based on the Battle of Castle Itter already completed. A bonus mission has also been made, where you play as Norwegian commandos & another bonus mission where you play as Volkssturm is almost completed. 26 new weapons have been added, including missing icons such as the P08 pistol, M2 automatic carbine, suppressed Sten Mk IIS & RGD-33 grenade. There are new rifle-grenade types: incendiary & armor-piercing. The rifle-grenade-launchers are now also able to fire regular rifle ammunition in addition to firing grenades. With other words, rifle-grenadiers are now able to shoot, blow up, burn & tank-hunt, given the ammunition & opportunity. This also means rifle-grenadiers don't have to carry an additional rifle. Portable bags are coming, such as haversacks. They act like regular boxes, except you can keep them in your inventory, giving you more effective space. They can also be used for reserve-ammunition, back-up weapons, as well as allow quick trading or dumping of items. The Chasseurs Alpins in Green Blood now have their own uniforms. The Kriegsmarine uniform have also been significantly improved, in addition to new Volkssturm uniforms for the up-coming mission. The inventory space of vehicles will be increased. The added space will allow you to more effectively stock up on anything you wish. dgn is also currently working on creating new vehicle schematics images for the inventory back-grounds, so that vehicles will have correct back-grounds. You will be able to fire rocket-launchers & grenade-launchers whilst being prone in Alpha-8. The unit will no longer be forced into a crouch position. Units put on fire at will mode no longer go into standing position before firing as well. This will make units equipped with the aforementioned weapons less suicidal & more stealthy. Fold-able weapons such as the MP-40 now take up 1 less horizontal inventory space. Resuscitation Kits are now accessible via the "grenade slot", the slot next to the weapon slot. You no longer have to open up the inventory in order to revive allies, just select the Resuscitation Kit as easily as you would a grenade. There are more minor & major things in the works, but that is all we feel like reporting for now. Tacos Mod version Alpha-6 is now available for download. This addon include bonus mission named Hard to take Suburb. Simply extract the file in the mods folder.Enjoy! This is a tested english version of our mod. I hope you have fun. Minimod to traslate main mod to Spanish languaje. Activate Pacific mod first. EVERY MAPPER/ MISSION SCRIPTER ATTENTION! I'm planning on making a mod for the original Men of War in which every single multiplayer map is a singleplayer mission. The missions must be realistic or based on real life events. I would like to name the mod "Forgotten Heroes of World War II" because in most of the missions (not all of them) the player will control a small amount of units or even only one man. The Frontline MP maps will have missions, Bazerville will have a mission, Bocage will have a mission (literally every single map). I could make the missions and the mod myself but it would take a lot of time so... if someone could help me with scripting a part of the missions please send me a private message and respond to this comment. Thank you. just bought this game off Steam after discovering my old disc was broken, does anyone know where I can download the map editor for single player missions? Here: Moddb.com but I don't think it will work properly. Why in the Steam do not sell these additions consisting of three parts! !? There isn't any Cheat Mod for S:HoWWII as it wasn't possible to make.